The Juneau Icefield Research Program (JIRP) has been examining the glaciers of the Juneau Icefield since 1946. Until the NASA Landsat program began field measurements and aerial observations were the only means to observe the glaciers of the icefield. For more than 40 years it was Maynard Miller, U of Idaho, who led this expedition that has trained so many of today’s glaciologists, today it is Seth Campbell, U of Maine. Given the difficult weather conditions that produce the 4000+ square kilometers of glaciers, this was not a task that could be done comprehensively. Here we examine the changes from the August 17, 1984 Landsat 5 image to the June 21, 2013 image from newly launched Landsat 8. Landsat 5 was launched in 1984, Landsat 8 launched in 2013. 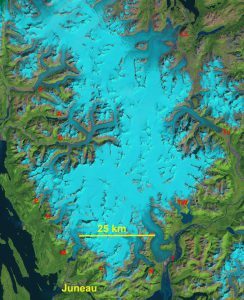 The Landsat images have become a key resource in the examination of the mass balance of these glaciers (Pelto, 2011). The August 17th 1984 image is the oldest Landsat image that I consider of top quality. I was on the Llewellyn Glacier with JIRP on the east side of the icefield the day this image was taken. On June 21, 2013 JIRP’s annual program had not begun, but the field season is now underway once again observing fin and reporting from the field across this icefield (Pelto, 2017). First we have the two reference images of the entire icefield that indicate the location of the 12 main glaciers we focus on here. Followed by a chart indicating the amount of terminus change, 14 glaciers have retreated and one has advanced. 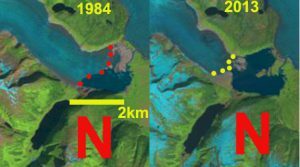 This is followed by 12 closeup glacier by glacier comparisons of the terminus, with the 1984 image always on the left and 2013 on the right, the 1984 margin is marked with red dots and the 2013 with yellow dots. 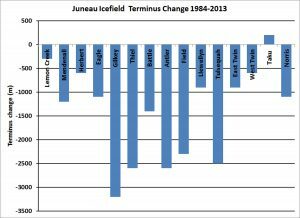 This is an update to an examination of the Juneau Icefield terminus changes from 1948 to 2005. 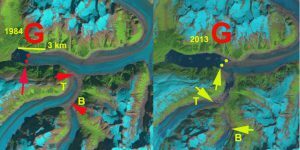 There are also links to more detailed discussions for each glacier, as the focus here is on the 1984 to 2013 changes visible in the images here. 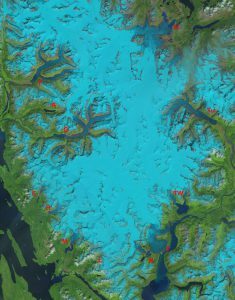 The images were first overlain in ArcGIS and the terminus change based on three measurements one at the glacier terminus midpoint, one each halfway to the margin from the mid-point. The exception is the Taku Glacier which is based on the JIRP field measurement mean and the Llewellyn where three measurements are made on each of the two termini, the average is then rounded to the nearest 100 m. The ongoing retreats reflects the long term negative mass balance of the glaciers with the exception of the Taku Glacier. The ongoing warming of our globe will continue to lead to retreat. The glaciers are all fed from the central portion of the icefield that always has a large snow covered area even at the end of recent warm summers. August 17, 1984 Landsat 5 image: N=Norris, L=Lemon Creek, M=Mendenall, H=Herbert, E=Eagle, G=Gilkey, A=Antler, F=Field, LL=Llewellyn, Tu=Tulsequah, TW=Twin and T=Taku. 1984-2013 chart of terminus change of individual glaciers from 1984 to 2013, see individual images below for the observed changes. From 1984 to 2011 Norris Glacier has retreated 1100 m. The glacier terminus that has been ending in a proglacial lake for the last 40 years is now mostly grounded. Since 1984 the northern half of this lake has formed and the long term lake development is discussed in a more detailed discussion on Norris Glacier. In 1984 Lemon Creek Glacier (L) has pulled back 300 m from a small lake it reached in 1984. Lemon Creek Glacier has a long term mass balance record that indicates more than 15 m of thinning from 1984 to 2012. This thinning is more dramatic than the 300 m retreat that has occurred. The yellow arrow indicates a tributary that no longer connects to the glacier. mendenhall glacier change Mendenhall Glacier is the most visited and photographed terminus in the region. The glacier in 1984 ended at the tip of a prominent peninsula in Mendenhall Lake. By 2013 the terminus has retreated 1200 m, with an equal expansion of the lake. 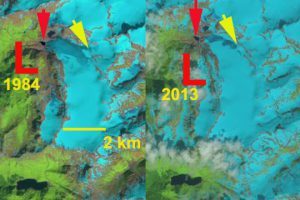 The red arrows indicate a tributary that decreased dramatically in width and contribution to the main glacier. This is the location of Suicide Basin, where a lake has formed the last two summers and then rapidly drained. A nice set of images of the glacier are provided by Matt Beedle. Herbert Glacier has retreated 600 m since 1984. The width of the terminus has also declined. The red arrow indicates a tributary that no longer feeds the main glacier. Eagle Glacier has retreated from the edge of a lake in 1984. The retreat of 1100 m is rivaled by the width reduction of the glacier in the lower 3 km. Eagle Glacier‘s ongoing retreat is examined in more detail. Antler Glacier is actually a distributary glacier of the Bucher Glacier, which in turns joins the Gilkey Glacier. As this glacier has thinned, less ice has overtopped the lip of the valley that Antler occupies. In 1984 Antler Glacier was 3 km long descending the valley to end near a proglacial lake, that it had recently occupied. By 2013 the glacier was just 400 m long, having lost 2600 m of its length.field glacier change Field Glacier in 1984 ended at the edge of an outwash plain with a few glimpses of a lake developing near its margin. 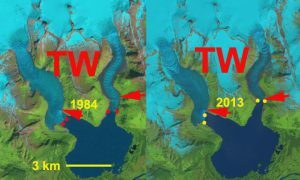 By 2013 a substantial lake has formed at the terminus and the glacier has retreated 2300 m. A lake has also developed at the first terminus joining from the east, most of the width of this glacier has been lost. It is clear that the two lakes will merge as the retreat continues. lewellyn glacier change The second largest glacier of the icefield is the Llewellyn Glacier which is in British Columbia. The glacier has several termini, here we examine two of them that have retreated 900 m from 1984-2013. Hoboe Glacier is another terminus that has been examined, but not in this post. This has led to formation of new lakes, and water level changes in existing lakes. Matt Beedle has examined the recent changes at the terminus. 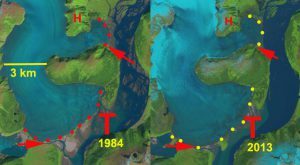 Tulsequah Glacier in 1984 ended at an outwash plain with a small marginal lake beginning to develop, red arrow. 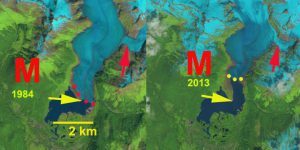 By 2013 a large proglacial lake has developed due to the 2500 m retreat. 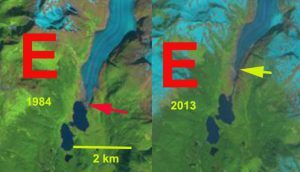 A side valley down which a distributary tongue of the glacier flowed in 1984 has retreated out of the valley by 2013, pink arrow. The East and West Twin Glacier are receding up separate fjords, though they are fed from a joint accumulation zone. The East Twin is a narrower glacier and has retreated 900 m. The West Twin has retreated 600 m, at an elbow in the fjord. Elbows like this are often good pinning points that are a more stable setting, once the glacier retreats out of the Elbow retreat should speed up. Taku Glacier is the largest glacier of the icefield and unlike all the others it has been advancing non-stop over the last century. The sustained positive mass balance from 1946-2012 has driven this advance (Pelto, 2011), this led to the glacier thickenning along its entire length. Since 1950 observations of velocity near the snowline of the glacier by JIRP indicates that the glacier has had a remarkably steady flow over the past 50 years (Pelto et al, 2008). Since 1988 the glacier has not been thickening near the snowline as mass balance has declined. We have been able to observe the snowline movement in satellite images to help determine the mass balance. The changes at the glacier front are quite variable as the glacier advances. JIRP measurements of the terminus indicate this from 2001-2008 with an interactive map from Scott McGee, indicating advances in some area, minor retreat in others and back and forth in others. In 2012 JIRP was back at the terminus creating the map below. There is no change at the east and west side of the margin since 2008 and 55 to 115 m of advance closer to the center.